Pain is always concerning, but understanding whether the pain is chronic or acute can make a big difference in relief and treatment, as the two are managed differently. Here are four ways to determine which type of pain your senior loved one may be experiencing, brought to you by the staff at Home Care Assistance in Oakville. Pain is considered chronic if it persists beyond six months, but acute pain usually lasts less than thirty days. Pain that lasts more than thirty days, but has not yet reached six months is called subacute pain. Acute pain tends to start suddenly and may be mild or severe. Chronic pain usually begins more mildly and progresses over time. 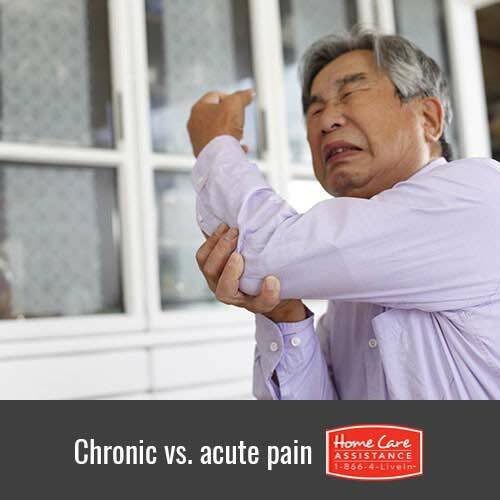 However if acute pain remains untreated, it can become chronic over time. Acute pain is typically caused by an injury, such as getting burned or breaking a bone. Chronic pain remains long after the original injury has healed. Cancer pain is frequently chronic, as is pain caused by damage to the nerves. Chronic pain may also be caused by conditions that affect normal aging. Chronic pain is more likely to be accompanied by other symptoms such as fatigue, depression, or a weakened immune system, while acute pain does not usually have additional symptoms due to its shorter duration. Some seniors may feel they can manage their pain without any assistance, but both chronic and acute pain can create additional daily challenges for your loved one, leading to the need for in-home care.Home Care Assistance offers hourly and live-in care in Oakville, and our caregivers are available to provide medication reminders or assist your loved one with any immobility issues that may result from chronic or acute pain. All of our senior care services are backed by a 100% satisfaction guarantee, and we never ask our clients to sign long-term contracts. To schedule a free in-home consultation, call one of our qualified Care Managers at (519) 590 2792 today.